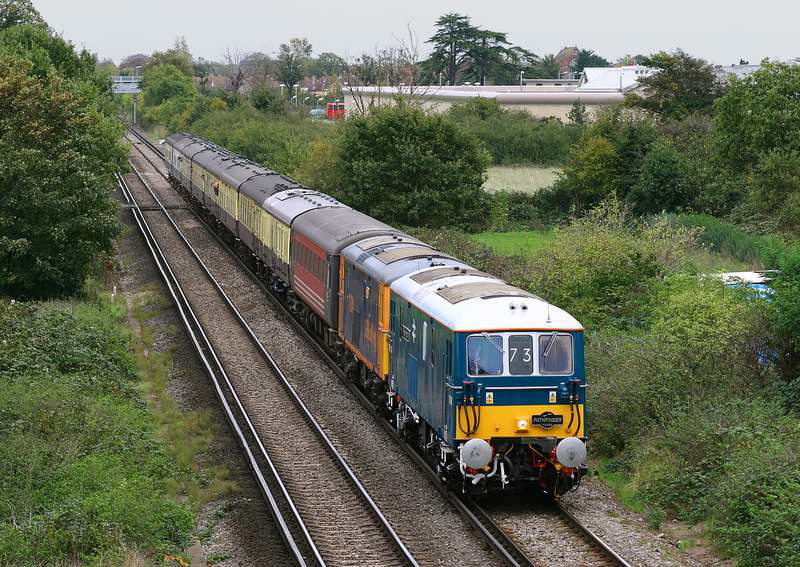 Newly restored to mainline operation, the preserved 73136 Perseverance was paired with GBRf's 73204 Janice to work the 1Z41 Euston to Euston via Reigate section of the Pathfinder Tours 'Capital Crusader' railtour on 5 November 2005. The tour originally started from Liverpool Lime Street as 1Z40 behind 40145. The tour is pictured here passing Shortwood Common (near Staines) with the brand new Bronzefield Prison in the background. Obviously the 73s are working on the 'juice' here, but when they came to traverse the North Downs line a little later on, apparently 73204's engine didn't start, resulting in 73136 having to struggle on with just 600hp, with the result that the speed dropped to around 12mph at one point!